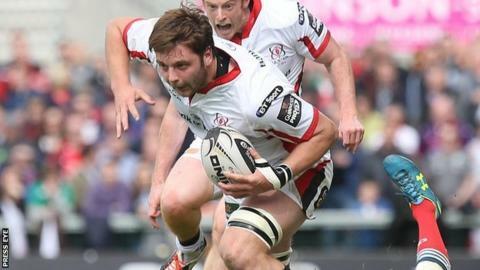 Ulster Head Coach Neil Doak has indicated that the province will appeal the red card received by Iain Henderson in the 23-23 Pro12 draw with Munster. The second row was sent-off by referee Nigel Owens late in the game for careless use of the head at a ruck. "I don't think there was any malice. It was just a timing issue," said Doak. "The referee felt it was dangerous play but from our point of view I don't think it was. If he gets banned or cited we will definitely appeal." Doak added: "From the replay it looked as if Iain came in pretty low to clean out the ruck. We'll just have to wait and see what the procedure is." Meanwhile Ulster props Callum Black and Wiehahn Herbst both came off injured during the game and their fitness will be assessed ahead of the final regular league game of the season against Glasgow next Saturday. "We'll have a look at Callum and Wiehhan over the next 48 hours and see how they progress. We'll wait to see the extent of their injuries and take it from there." Paddy Jackson converted replacement Paul Marshall's late try to salvage two points at Kingspan Stadium, an outcome the Ulster coach concedes is "bittersweet". "We had the euphoria of getting the draw but we were looking to win our final two games to give us the best possible chance of securing a home semi-final play-off tie. "It's frustrating that it is out of our own hands now. We have to win at Glasgow and hope something falls in place for us in terms of results elsewhere." Doak added that he was pleased with the "character" shown by his side in salvaging a draw against their Irish interprovincial rivals after being reduced to 14 men. "On reflection we caused Munster a few problems but we weren't clinical enough with the ball. On the plus side, we finished both halves strongly. "Tommy (Bowe) and Paul ran in for tries, while Paddy Jackson did exceptionally well, considering he hadn't kicked a ball for a while in games. "To have the composure and calmness to kick that final conversion was pleasing for him. "It was a typical interpro tie and both sets of players are battered and bruised. We have some areas to tighten up on ahead of the game with Glasgow.